The Loeys–Dietz syndrome is a recently described autosomal dominant aortic-aneurysm syndrome with widespread systemic involvement. The disease is characterized by the triad of arterial tortuosity and aneurysms, hypertelorism, and bifid uvula or cleft palate and is caused by heterozygous mutations in the genes encoding trans-forming growth factor /3 receptors 1 and 2 (TGFBR1 and TGFBR2, respectively). The clinical and molecular characterization of 52 affected families were performed. Forty probands presented with typical manifestations of the Loeys–Dietz syndrome. In view of the phenotypic overlap between this syndrome and vascular Ehlers–Danlos syndrome, an additional cohort of 40 patients who had vascular Ehlers–Danlos syndrome without the characteristic type III collagen abnormalities or the craniofacial features of the Loeys–Dietz syndrome were studied. A mutation in TGFBR1 or TGFBR2 was found in all probands with typical Loeys–Dietz syndrome (type I) and in 12 probands presenting with vascular Ehlers–Danlos syndrome (Loeys–Dietz syndrome type II). The natural history of both types was characterized by aggressive arterial aneurysms (mean age at death, 26.0 years) and a high incidence of pregnancy-related complications (in 6 of 12 women). Patients with Loeys–Dietz syndrome type I, as compared with those with type II, underwent cardiovascular surgery earlier (mean age, 16.9 years vs. 26.9 years) and died earlier (22.6 years vs. 31.8 years). There were 59 vascular surgeries in the cohort, with one death during the procedure. This low rate of intraoperative mortality distinguishes the Loeys–Dietz syndrome from vascular Ehlers–Danlos syndrome. Mutations in either TGFBR1 or TGFBR2 predispose patients to aggressive and wide-spread vascular disease. The severity of the clinical presentation is predictive of the outcome. Genotyping of patients presenting with symptoms like those of vascular Ehlers–Danlos syndrome may be used to guide therapy, including the use and timing of prophylactic vascular surgery. Characteristics of the Loeys–Dietz Syndrome. 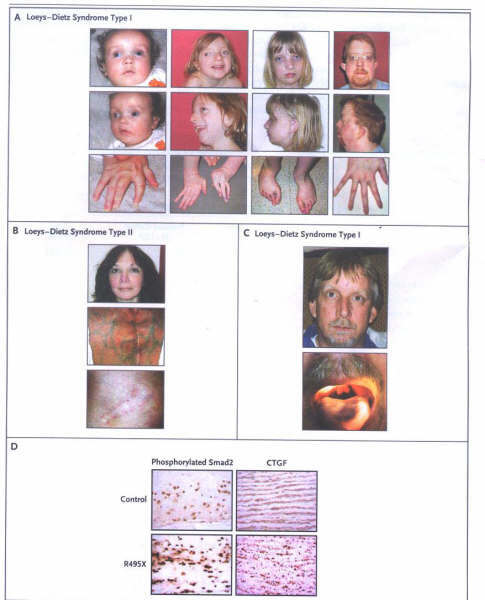 Panel A shows typical facial characteristics of patients with Loeys–Dietz syndrome type I at different ages: blue sclerae, hypertelorism, proptosis, malar flattening, retrognathia, camptodactyly, and arachnodactyly. Panel B shows the facial characteristics of a patient with Loeys–Dietz syndrome type II. The translucency of the skin is evident, with visible veins and distended scars. Panel C shows a patient who had type I with a nonsense mutation (R495X) in TGFBR2, hypertelorism, and bifid uvula. Panel D shows the results of immunostaining of aortic tissue from a patient who was heterozygous for the R495X mutation, revealing increased nuclear accumulation of phosphorylated Smad2 and levels of expression of connective-tissue growth factor (CTGF), both indicative of increased TGF-B signaling, as compared with an age-matched control. The National Istitutes of Health is sponsoring a clinical trial that will compare losartan (angiotensin II type1-receptor antagonist with beta -blocker therapy in children and young adults with Marfan's syndrome and aortic aneuysm. From The N ENGL J MED 355;8(August24, 2006), Pages 788-798. The opening of the aneurysm usually contains a laminated thrombus that may or may not completely fill the aneurysm. Thoracic aortic aneurysms (see figures above: 50, 51a, 51b, 51c, 51d, 51e, 51f, 51g) have a five year mortality, which approaches 75%. One third to one half of these deaths result from rupture of the aneurysm (see figures 51d and 51e). Surgical repair constitutes the only effective treatment for thoracic aneurysms. It is urgently indicated in patients with a large aneurysm (6 cm or larger), especially if symptoms suggest expansion or compression of an adjacent structure. Cardiac failure from aortic regurgitation or aortocameral fistula may also necessitate early operative treatment. Resection is less urgent in small, asymptomatic aneurysms. Consideration of the severity of associated diseases is also important in selection of patients for surgery. Surgical treatment consists in replacing the resected aneurysmal segment with a Dacron graft attached to relatively normal aorta proximally and distally. Specific surgical procedures vary with the site of the aneurysm and the need for maintaining circulation to distal parts of the body during the necessary period of aortic occlusion (see figure 51c). Aneurysms of the abdominal aorta are common; about 114,000 new cases are diagnosed each year. An abdominal aortic aneurysm, which is usually located in the infrarenal portion of the vessel, is defined as an enlargement that exceeds the normal diameter by 50% or more. Conventially, an abdominal aortic aneurysm measures more than 3 cm in diameter ( see figure 171-1 and -2 ). The primary complication is rupture, which leads to 15,000 deaths per year in the US and makes abdominal aortic rupture the 13th leading cause of death in this country. Prophylactic repair is therefore recommended for aneurysms that are more than 5 cm in diameter. Endovascular repair of abdominal aneurysms with stent grafts is a new image-guided, catheter-based approach that provides a valuable alternative to standard open surgical repair. Radiologic imaging plays an essential role in preprocedure evaluation, the procedure itself, and patient followup. The ultimate goal remains the same - Complete exclusion of the aneurysm sac to prevent rupture ( see figure 171-3 and-4 ). Stent graft design is an intraluminal device that consists of a supporting metal framework and synthetic graft M material that is either self-expanding or balloon-expandible. Percutaneous delivery is made possible by compacting the device onto a catheter or compressing it into a sheath. Stent grafts are available in three basic forms, including tube, bifurcated, and aorta-unilateral designs. About 60% of patients with abdominal aortic aneurysms are eligible for endovascular stent graft repair. Morbidity rates have been reported at 23% for surgery and 12% for endovascular repair. Hospital stay is reduced by two-thirds, to 3.4 days. Rupture is rare. One critireon for success is the absence of endoleaks, which are indicated by persistent opacification of the aneurysm sac after insertion of the stent graft ( see figure 173-6 ). Reference:Montgomery,M.L.,MD and Sullivan,J.P.,MD,Advances in interventional radiology,Postgraduate Medicine,Vol.109,No.6,June 2001,Pp97-98. This term applies to an area in the heart, which is a thinned-out transmural scar that has completely lost its trabecular pattern. This scar is clearly delineated from surrounding ventricular muscles. Aneurysms usually have a wide base and one half are lined by a laminated thrombus. The aneurysm location is usually anterior, anteroapical or apical. It can be diagnosed by a typical bulge on the left ventricular border on chest x-ray, with calcification around the apex. EKG evidence includes a large anterior infarction with ST-segment elevation persisting beyond 2 weeks following the infarction. Two-dimensional echocardiographic studies can confirm the diagnosis (see figure 51a). Ventricular aneurysms are associated with a reduced survival rate due to left ventricular dysfunction. Roberts, R., MD, Morris, D., MD, Pratt, C.M., MD, Alexander, R.W., MD, Pathophysiology, Recognition, and Treatment of Acute Myocardial Infarction and its Complications, Hurt's The Heart 8th edition, p 1153. A pseudoaneurysm is a rare complication of myocardial infarction, the prevalence of which is not known. The probable sequence of events in the development of a pseudoaneurysm is as follows: occurrence of a transmural infarction with localized pericarditis arising at the site of infarction; development of adhesions between the visceral and parietal pericardium; rupture of the infarcted myocardium, with the extravasated blood confined by the adherent pericardium; progressive enlargement of the aneurysmal sac; and development of thrombus within the sac. Unlike a true ventricular aneurysm, a pseudoaneurysm has a narrow base (site of rupture). The wall is composed only of thrombus and pericardium, and the risk of rupture is high. While the neck is small (its diameter is less than 50% of the diameter of the fundus), the pseudoaneurysm may progressively enlarge to become larger than the left ventricle. The pseudoaneurysm may be clinically silent or may present as progressively worsening heart failure, an abnormal bulge on the cardiac border, persistent ST-segment elevation in the area overlying the infarction, or systolic murmurs. The diagnosis can be established by two-dimensional echocardiographic studies, ventriculographic radionuclide studies, MRI, or left ventriculographic contrast studies (see figure 170). This is an unusual complication of aortocoronary saphenous-vein grafting for coronary obstructive atherosclerosis. See the text description and figure 157. Reference:Porter,G.F. andGentles,T.L.,N Engl J Med,Vol.345,No.2,July12,2001,p.98. A 74-year-old woman with a history of hypertension, hypercholesterolemia, and non–Q-wave myocardial infarction presented with exertional angina that had worsened over the course of the preceding month. 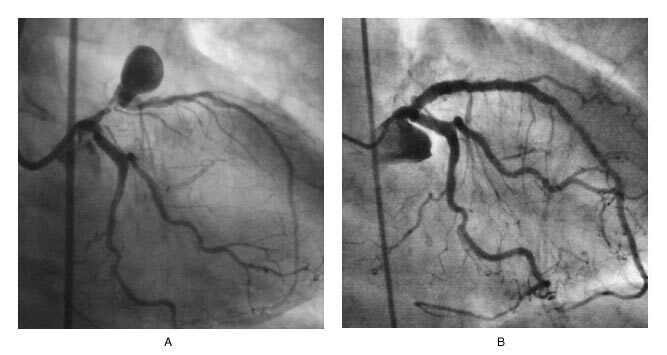 Coronary angiography revealed triple-vessel coronary artery disease and a large saccular aneurysm of the proximal left anterior descending coronary artery (Panel A). There was severe stenosis in the artery immediately proximal to the aneurysm and stenosis in the middle portion of the artery. Intravascular ultrasonography of the proximal left anterior descending coronary artery showed that the neck of the aneurysm was 10 mm in length. The lesions in the circumflex artery and the right coronary artery were stented. The lesion in the middle portion of the left anterior descending coronary artery was stented with a conventional tubular, slotted, stainless-steel stent, and the stenosis and aneurysm in the proximal portion of the artery were treated with a polytetrafluoroethylene-covered stent. The covered stent completely closed the entrance of the aneurysm, and no contrast medium was seen entering the aneurysm in the final angiographic images (Panel B). The patient was discharged, and treatment with aspirin and clopidogrel was begun. At six months of follow-up, she had had no events. Video B shows the artery after repair. A bulging or ballooning out of part of the wall of one of the heart's upper chambers (atria ). If the aneurysm is present in the wall between the atria (the atrial septum), it is also known as an atrial septal aneurysm (ASA), an aneurysm of septum primum or an aneurysm of the septum secundum. An ASA has been associated with an increased risk of stroke and is often accompanied by the presence of a patent foramen ovale (PFO), an opening between the upper chambers (atria) of the heart. Normally, this opening is present in the developing fetus, and closes shortly after birth. It is often present since birth (congenital).